In this list, we shall talk about 5 running games for Windows 8 much like the Temple Run and Temple Run 2 games for Android and iOS. These games for Windows 8 are fun and challenging, and you will really enjoy playing them on your Windows 8 device to while away some time. All these apps can be downloaded free from the Windows 8 app store. If you are a fan of gaming apps, then you can try all of these apps one by one. So let’s read more about these games. FastBall 2 is a running game for Windows 8 device where you control the ball through 130 levels to reach the finish line. When you launch the app, you will be asked to choose between the game theme. You can choose between two themes – Cartoon or Futuristic. The Cartoon theme allows you to play the game in a style that resembles an animated ecosystem with cartoonish environment. The Futuristic theme looks like something straight out of a Star Wars movie, with glowing effects and metal encased stuff in the levels. There are three difficulty levels that you can choose from: Easy, Normal and Hard. Easy is good for amateurs, Normal is good enough for normal game play and Hard is extremely challenging and is meant for people looking for challenging game play. You have to jump the ball over the obstacles that come in the path and to do this, you can either use your mouse, or use the up arrow button on your keyboard. Once each level is complete, you will be shown a page of Level complete and will be taken immediately to the next stage. If you ask me, this game is extremely addictive! 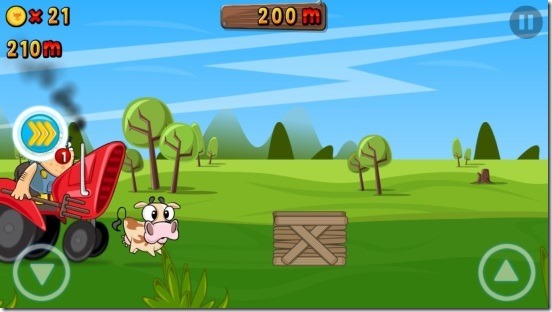 Run Cow Run is another running game where you play as a cow who is running from a steakhouse where the farmers want to cut it and make steak out of the cow. As the cow, you have to run and escape from the farmer who is chasing you in his tractor. You have to jump over and slide under the obstacles to successfully achieve a high score. To jump, simply press the up arrow, to jump higher, double tap the up arrow and to slide underneath the obstacles, press the down arrow on your keyboard. This game is based on missions that you have to complete to unlock new levels. Coins collected during runs can then be spent in the in-game shop to purchase power-ups like magnets, etc. The game may get a bit monotonous during long game plays, but the graphics of the game combined with the cuteness of the cow are sure to keep you entertained for hours on end! 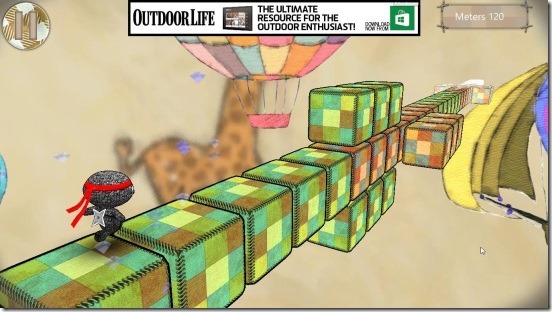 Ragdoll Run is a 3D running game for Windows 8. 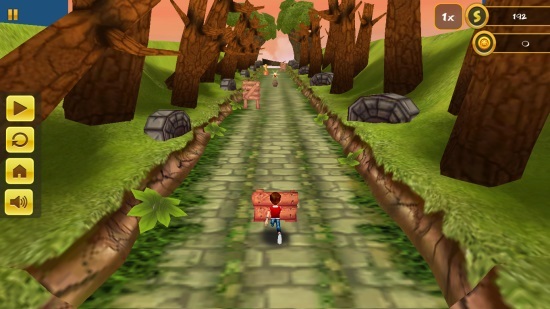 You play as the ragdoll who has to run on the path covered with obstacles. The up arrow on the keyboard can be used to successfully jump over the obstacles. There is another unique way in the game to avoid the obstacles, that is, you can rotate the path itself so that the obstacle faces some other direction and the path becomes free of obstacles for you. The path is cubical and these cubes rotate when you press the down arrow on your keyboard, rotating the obstacle along with them. Various power ups also present themselves on the path that you can collect during the game play. Apart from this, valuables like coins and gems present themselves on the path that can be collected by the ragdoll. These valuables can then be used to purchase power-ups in the in-game shop or to unlock the 12 characters present in the game one by one. There are a total of three difficulty levels in the game that can be chosen from the main screen, namely Easy, Normal and Hard. While playing 3D Jungle Run, one is instantly reminded of Temple Run. With a similar environment, the game offers good gaming experience on Windows 8 devices. The game relies on Mouse swiping, i.e., swipe left to right to move right, right to left to move left, upwards to jump, and swipe downwards to roll/slide. Although this idea makes the app work great on touch enabled Windows 8 devices, the lack of keyboard support makes non-touch Windows 8 device users feel a bit left out. The only gesture supported by the keyboard is jumping, which can be accomplished by using the spacebar key. 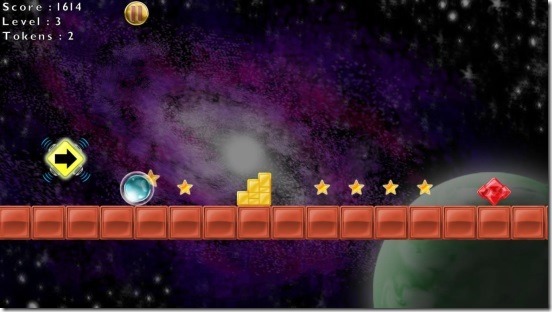 During the game play, you can collect coins as well as power ups which will appear along the entire path of the game. These power-ups can be upgraded via the menu of the game by spending some coins that you pickup while playing the game. 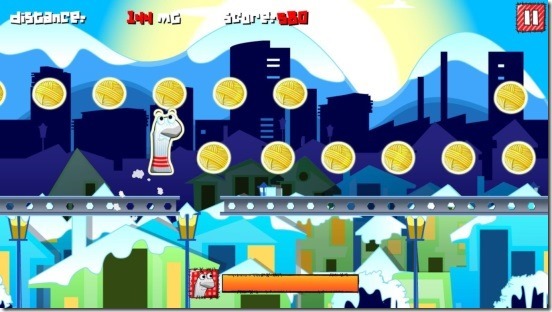 Sock Runner is a cute runner game where you play as a sock. The sock runs by itself on the platforms and you just have to avoid it from tripping or falling into breaks in the platform. Instead of coins, you have to collect gold rope-balls and clothespins (as the game calls them) which can then be used to purchase and upgrade power-ups. To jump over obstacles, press the up arrow once. To perform a double jump, double tap and keep the up arrow pressed. Power-ups like magnet, triple jump etc. can be picked up along the way and can be used to effectively achieve a higher score. This concludes my list of 5 Free running games for Windows 8. I’m sure that you’ll have a lot of fun whiling away your time on your Windows 8 device using these apps!